Berlin, Germany (9 October 2018) – The U.S. Green Building Council (USGBC) has named Hesse as the top state in Germany with the highest number of LEED (Leadership in Energy & Environmental Design) certified green buildings. Hesse is home to nearly 3 million GSM of building space comprising 95 LEED certified projects. 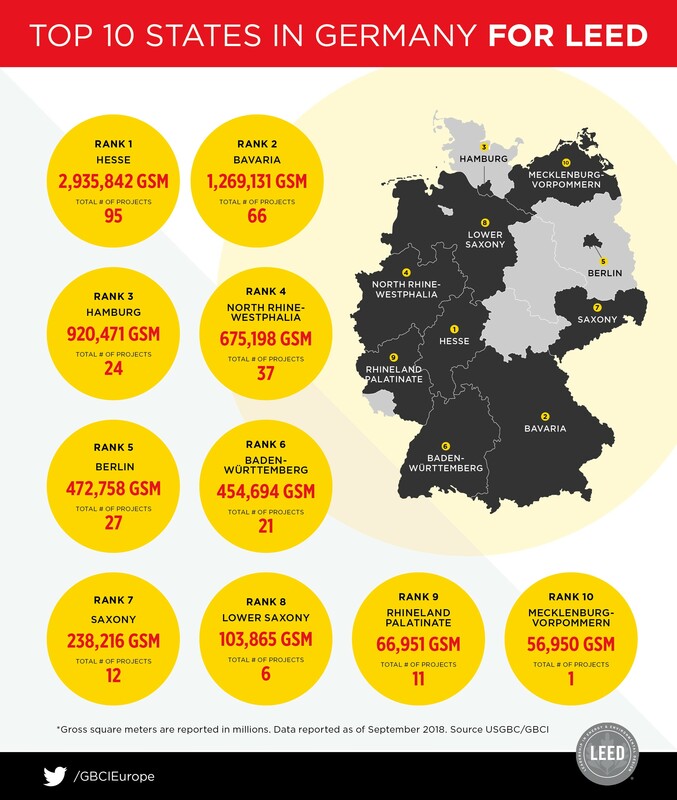 Following very closely is Bavaria with 66 LEED certified projects comprising 1.3 million GSM of building space. LEED helped create the definition of a green building and is the world’s most widely used building certification program across the globe, with nearly 100,000 projects certified globally. The LEED top 10 was released at this week’s EXPO REAL conference in Munich, Europe's largest real estate and investment trade fair. GBCI Europe was established in 2017 and is headquartered in Munich, to meet the increasing demands of green building in the region. GBCI Europe is helping drive the adoption of green building and business practices, fostering global competitiveness and enhancing environmental performance and human health benefits. Europe has been a leader of the green building market with tremendous interest and support for LEED. By establishing a local GBCI presence in Europe, USGBC is helping to further facilitate the global growth of a sustainable built environment locally and across the globe.